The two big highlights were the scavenger hunt where the kids searched through the museum by flashlights. And, of course, sleeping in the museum. Or not sleeping, as is more likely the case. 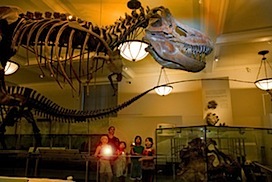 These AMNH sleep-overs get completely booked up and host hundreds of people. While one mom felt the museum did a great job of breaking people up into groups and having them in different areas at different times so you didn't realize how many people were there, I've heard from others who feel like it's a bit overwhelming. You don't get to decide where you will sleep. It could be in the Whale Room, Hall of Planet Earth, or the North American Mammals. And any choice is good. While people seem to like the idea of the Whale Room, some people find the other rooms a little more restful. While sleeping under the whale is surely an amazing experience, sleeping with that many people in the same room doesn't seem possible, and, sure enough, our kids didn't sleep much. Another grumble I heard was that the museum takes every opportunity to try to get you to buy stuff. But really these are minor things and don't take away overall from the magic of this event. Night at the Museum Sleepovers are scheduled periodically and sell out, so reserve your space well in advance. At $129 per person, it's a splurge, but worth it for this memorable experience, and would make a great holiday or birthday gift for any kid.